Exploit the results of the production launch of Vaden Automotive group with its 8 dealerships meeting and exceeding the Revlink challenge at $32 per Service Visit. 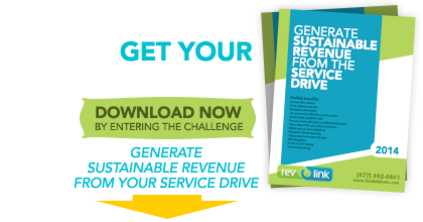 Revlink challenges its competitors, administrators, agents and dealers to earn a minimum of $22 per Service Visit in variable operation revenue sourced from the service drive. Copyright © 2015 Service Drive Challenge powered by Revlink Auto. All rights reserved. No organization has ever mastered generating variable operations revenue from the service drive. Many have tried and had some hit or miss success but NONE have been able to.... Revlink will be the MACK DADDY for dealers accross the nation to be able to predict, track, measure, and accomlish great success with service department customers. It has unlimited potential to add additional profit to a dealer's bottom line. $1.98 million in additional revenue. Integration with your DMS ensures you receive sales opportunities as soon as your service advisor creates a RO. An advanced reporting system allows you to hold your employees accountable. 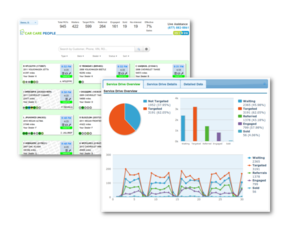 Our sales intelligence engine uses numerous decision points to provide opportunity evaluation. All you need to do is sell! Empower your sales staff with instant opportunity notifications. There is money to be made in the service drive. The proven Revlink process and technology can make it happen for you. a sustainable process of developing revenue out of the service drive. 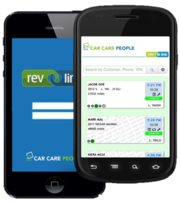 Revlink is a web based solution which intelligently pre-qualifies opportunities from the service drive and refers them in real-time to your sales department with the reporting and notifications you need to hold your team accountable. Our process and training ensures your sales team’s effective engagement with guaranteed results. This is your chance to take #1 position in the race to drive revenue out of the drive. Take the Service Drive Challenge. FREE. No obligation. Revlink Video is on the way! Vaden took the challenge, and they challenge you to take #1 position in the race to drive revenue out of the drive. Revlink is your guaranteed alternative to equity tools. Factories are asking its dealers to choose a Service to Sales opportunity provider. Consider Revlink!